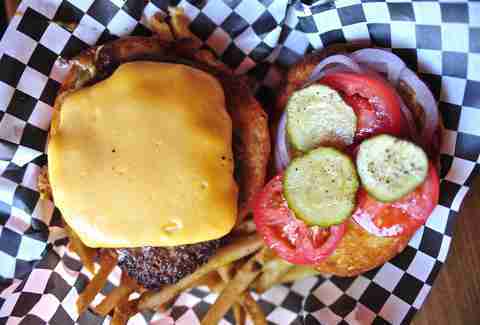 Everyone loves a good burger (even the vegetarians have the Keenan and Kel movie), but when it comes time for folks who write about good burgers in Denver to name the best, the same names tend to come up again and again. 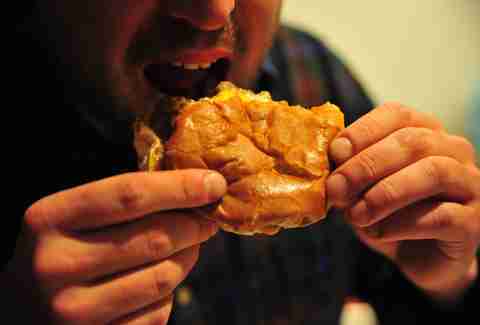 But Denver has plenty more under-the-radar beefy goodness out there that's worthy of your ravenous consumption. 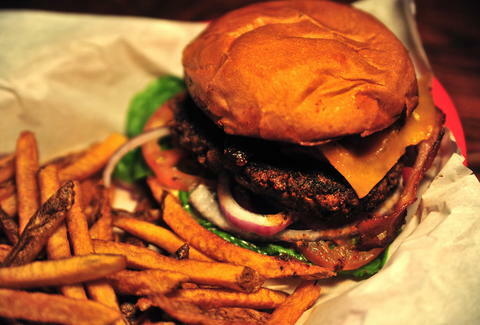 Here are eight examples that you won't find on the "best burgers" list from Eater. Or Westword. Or even Thrillist! The Blackened Bacon Burger may look fairly conventional, but the half-pound patty is seasoned with a spicy cajun rub that imparts some serious flavor before it's topped with bacon, cheddar, lettuce, tomato, red onion, and a cajun mayo. It's a bit messy, but the flavor combo is well worth a few destroyed napkins. Bonus: there're more than 75 beers at your disposal to pair with it. This hidden gem has the best tater tots in Denver, so it's no surprise that they're getting the job done burger-wise as well. 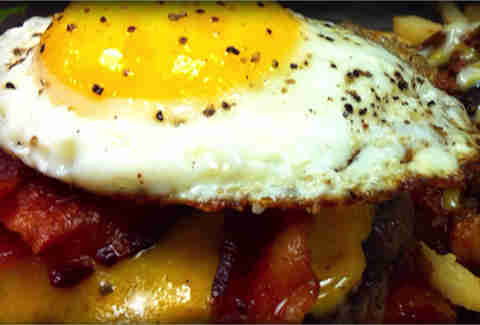 There are several excellent burgers to choose from, but for those with a big appetite (and an elastic waistband), try the Stupid Burger: double patties, double bacon, and double cheese with a sunny side up egg, LTO, and house pickles. It comes with a side of red chili cheese fries, because why not? Denver natives have known for years that Chubby's has the secret recipe to cure their hangovers: super-spicy green chile. 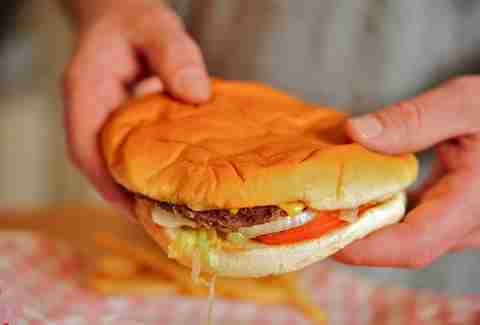 It's even better when it's inside (or on top of) a plain-old cheeseburger. This starts as a relatively unassuming patty, but add the green chile and you'll have a perfect little burger wrapped in foil to melt the cheese and keep the bread warm. Vesper's motto is "no anger", which you will understand once you bite into their cheeseburger. The meat is juicy and the housemade pickles add just the right amount of crunch to every bite. The thin-cut fries are seasoned with baharat, an Arabian spice that brings a far different flavor than what you find at your typical burger joint. 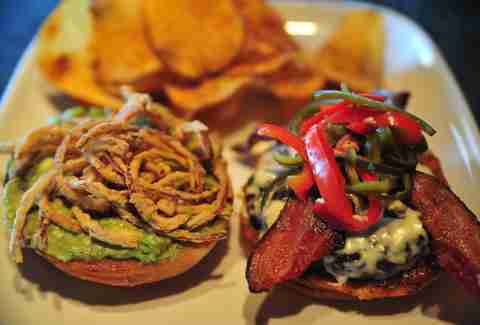 For a more upscale burger experience, get to Second Home, located inside Cherry Creek's JW Marriot. The patio is a draw all by itself, but it's even better when you order a burger to enjoy while cozying up by the fire pit. The grass-fed Creekstone beef patty is charbroiled but juicy, and the pillowy soft roll keeps everything together. Don't let this hole-in-the-wall on South Federal fool you. This old-school burger shack serves shakes, onion rings, and burgers so large they look like flying saucers. The burger patties are very thin, so maybe order a double or triple. All burgers come with LTO, mustard, and street cred! They won't win any beauty pageants, but it's what's inside that counts. 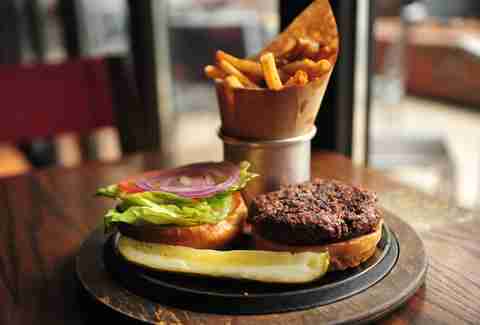 D Bar is on top of the dessert game, but did you know they make a mean burger? 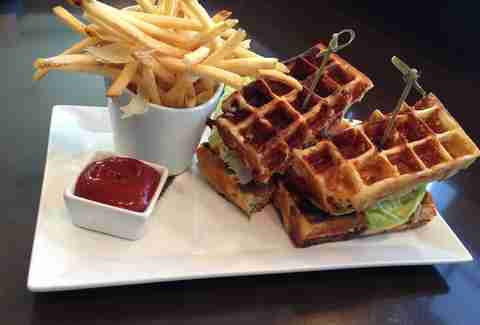 The KGB Burger is hardly conventional: 6oz of Kobe beef on an herb cheese waffle, with garlic aioli, white cheddar, applewood-smoked bacon, Bibb lettuce, and heirloom tomato. If Malkovich had been eating one of these instead of Oreos, he might not have lost all his money to Matt Damon. The Lolaburguesa is not only fun to say, it's fun to eat. The ground short-rib-and-chuck patty is topped with pickled chiles, a tomato-bacon jam, avocado, crispy onions, and queso. It's only available during weekend brunch from 10am-2pm, so get there and don't forget to order some tequila while you're at it.